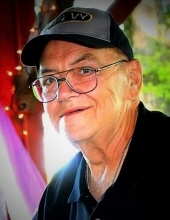 Bruce E. Sarcinella, 70, of Greenville, passed away unexpectedly, of natural causes on Tuesday afternoon, February 5, 2019. He was born in Greenville, PA on March 4, 1948 to the late Patrick A. and Virginia M. (Conn) Sarcinella. Bruce was a 1967 graduate of Reynolds High School. He worked various jobs throughout his career, including: the former Greenville Steel Car as a welder, Curtis Trucking and Sloan Supply as a truck driver, PennTecQ, and also did some carpentry work. He held memberships in: Fraternal Order of Eagles Aerie 805, Loyal Order of the Moose Lodge 276, and the Italian Home Club, all in Greenville. Bruce enjoyed fishing, hunting, following high school wrestling, and spending time with his grandchildren. He was a beloved husband, father, grandfather, and great friend to many. He is survived by his wife at home, Terri Ann (Campbell) Sarcinella. They were married on September 13, 1986. Also surviving are: two sons, Michael Sarcinella and his companion, Lisa Brickle, of Greenville, and David Sarcinella and his companion, Kathy Griffith-Sawyers, of Sharon; five daughters, Connie Rimer and her husband, Gene, of Greenville, Melissa Smith of Elyria, OH, Lane Sarcinella of Williamsport, PA, Annette Walters and her husband, Ryian, of Greenville, and Melony Culver of Greenville; eleven grandchildren, Dillon Sarcinella and his wife, Jennifer, of Greenville, Cierra Beilstein and her husband, Josh, of Sharpsville, Johnathin Rimer of Greenville, Nicholas Smith of Elyria, OH, Kennedy Smith of Elyria, OH, Payton Mentzer of Greenville, Ryian Walters, Jr. of Greenville, Letha Walters of Greenville, Zach Richards of Greenville, Cheyenne Richards of Greenville, and Alissa Rimer of Greenville; four brothers, Tony Sarcinella and his wife, Becky, of Cottageville, SC; Charles Sarcinella, Jerry Sarcinella, and Rick Sarcinella, all of Meadville; and several nieces, nephews, aunts and uncles. In addition to his parents, he was preceded in death by a granddaughter, Emily R. Burr, and a brother, Kenneth Sarcinella. A memorial service will be held at Osborne-Williams Funeral Home & Cremation Services, Inc., 73-75 Columbia Ave., Greenville, at 6:00 pm on Monday, February 11, 2019, with Rev. Joel DiAngi, pastor of Christian Assembly in Greenville, officiating. The family will receive friends from 5:00 to 5:45 pm at the funeral home. Burial of cremains will be held at Stevenson Cemetery, Greenville, at a later date. Memorial contributions can be made to: Good Shepherd Center, 144-146 Main St. Greenville, PA 16125. Messages of sympathy, stories, and photos can be shared at: www.osborne-williams.com. To send flowers or a remembrance gift to the family of Bruce E. Sarcinella, please visit our Tribute Store. Rev. Joel DiAngi, pastor of Christian Assembly in Greenville, officiating. "Email Address" would like to share the life celebration of Bruce E. Sarcinella. Click on the "link" to go to share a favorite memory or leave a condolence message for the family.